This wedding collection features a beautiful vintage style background of Gardenias in shades of green and white. The design is perfect for both formal and semi-formal weddings held during the spring or summer. There are invitations, RSVPs, Reception cards, custom postage stamps and a save the date announcement. Each piece of this collection can be purchased separately and personalized on-line. 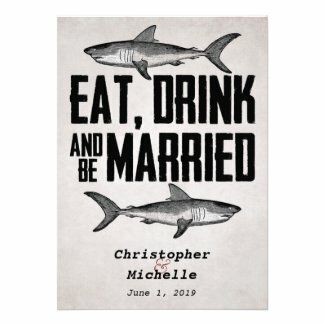 These unique vintage style wedding invitations are just the thing for the shark loving couple. 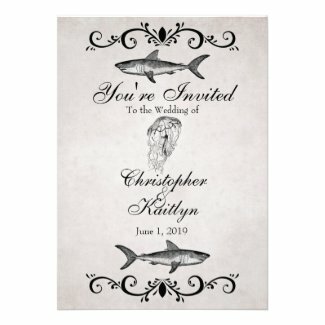 They are great for beach and ocean themed weddings and perfect for anyone tying the knot during Shark Week. There are both formal and casual designs featuring vintage shark images, a variety of text styles and even a beautiful jellyfish. 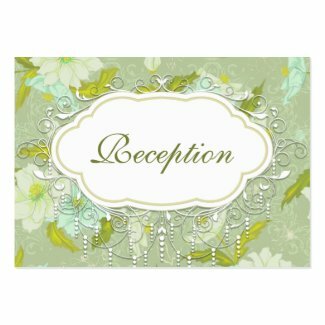 Each invitation has matching RSVP cards, reception cards and custom postage stamps. 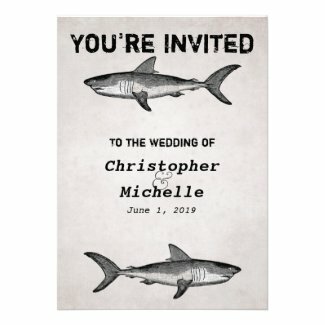 Select any shark wedding invite below to view additional details and edit. Get your wedding off to a great start with the perfect invitations. This site features a unique collection of affordable custom wedding invites.